A funny thing has happened this year: just as multi-core computers are making software more powerful, DSP has gotten easier and cheaper. Result: new hardware that behaves like software. Look no further than long-time software-only, analog emulation house Arturia, who have unveiled a new hardware synth called Origin that builds on the legacy of their soft synths. The Origin builds in the components of Arturia’s emulation of the Moog modular, minimoog, ARP 2600, Prophet VS, and CS-80, now in hardware form, but allows you to mix and match modules via an on-screen, plug-in-like interface. Now, of course, you can already mix and match all kinds of synthesis methods in software, but Arturia claims that the Analog Devices TigerSHARC DSP chips in the Origin allow greater audio fidelity and performance than even high-end dual-core CPUs. That certainly seems likely; even as CPUs become faster, they’re still rarely as efficient as dedicated DSP. 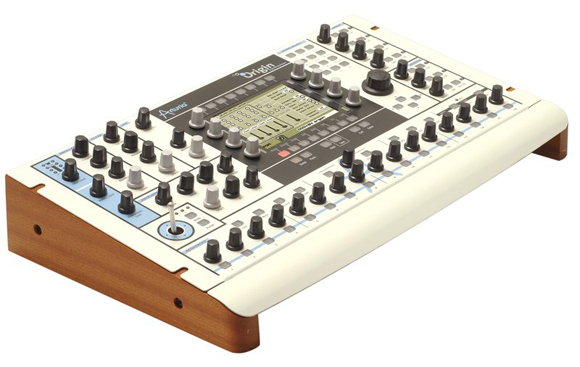 The big question to me is, have Arturia — new to the DSP game — sufficiently molded their instruments to the new hardware? We’ll just have to wait to hear the results. Arturia’s going to have a lot of competition, from software running on Core Duo laptops to new virtual analog hardware like the Waldorf gear. It’ll be interesting to watch this one shake out. As usual, Arturia isn’t just emulating; they’ve added twists like X/Y digital effects, an advanced “Galaxy” modulation section, easy MIDI assignment, and a step sequencer. The downside here: the “TAE” engine Arturia can sacrifice accuracy in the name of versatility; I’d really like to see an obsessive model of the Jupiter. We’ll know once we test it — especially once Jupiter lovers pull it apart.